Get to know if Macquarie is the right uni for you. Come meet us on campus or chat with us at our online events. Uni life doesn't have to be a mystery. We’re opening our doors to Year 11 and Year 12 students for the chance to taste what a day in the life of a Macquarie student is really like. We’ll take you through our early entry program, courses, scholarships, pathway options and give you the opportunity to speak one-on-one with course advisers. Parents are encouraged to attend. 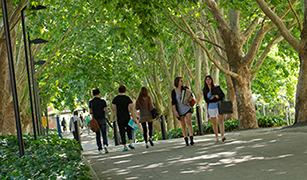 Find out about how your subjects for the HSC can impact your university studies. We’ll address adjustment factors, assumed knowledge, university admission and scholarship processes. Our doors are open all day for you to experience our campus, speak with academics, current students and find out all about uni life. Various dates and formats during the school holidays. Open to Year 12 students via HSC in the Holidays. Explore the unique and interactive side of the arts, history and science through our diverse collections and museums. Find out about our tours, workshops and other special events. We will let you know once registrations are open.